Researchers have identified a one-step process to convert a plant-based sugar into a chemical compound that can be used to manufacture other substances, including a natural pharmaceutical for treating conditions such as congenital heart disease and erectile dysfunction. Theirs is a simple one-step approach that converts the sugar 2-deoxy-d-glucose, which can be prepared from d-glucose, into a compound called 4 hydroxy-2-(hydroxymethyl)cyclopent-2-en-1-one. The process involves heating a watery solution of 2-deoxy-d-glucose to 140°C for 28 hours, to convert 80 percent of the sugar into the second compound. Heating the sugar to 160°C for seven hours produces a 74 percent yield. 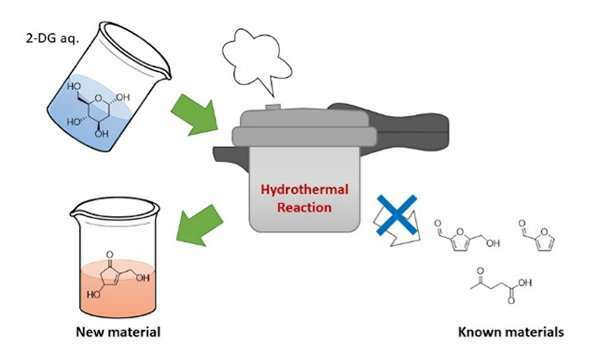 Their method, which is similar to a pressure-cooker, uses a lower temperature and pressure than those applied in general biomass processes, and does not use catalysts. A previous study reported producing the second compound from quinic acid using a ten-step process with a yield of only 3.5 percent.